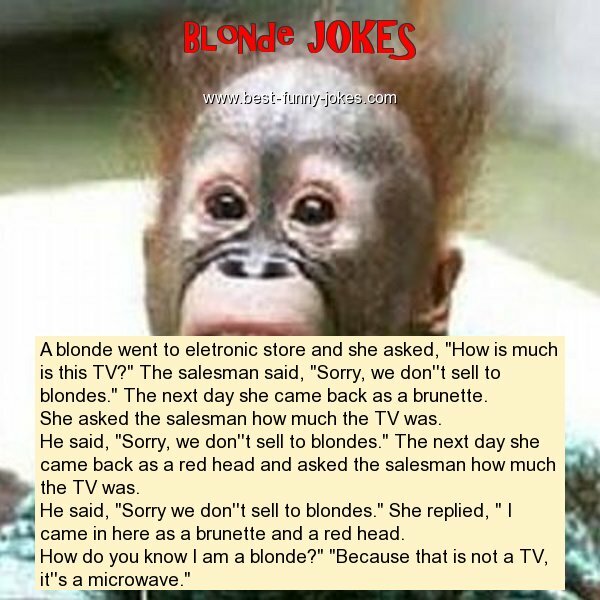 A blonde went to eletronic store and she asked, "How is much is this TV?" The salesman said, "Sorry, we don''t sell to blondes." The next day she came back as a brunette. She asked the salesman how much the TV was. He said, "Sorry, we don''t sell to blondes." The next day she came back as a red head and asked the salesman how much the TV was. He said, "Sorry we don''t sell to blondes." She replied, " I came in here as a brunette and a red head. How do you know I am a blonde?" "Because that is not a TV, it''s a microwave."